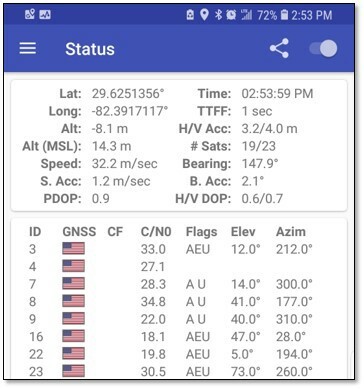 Android 9 - GNSS Developer options? Can toggle OFF and ON (OFF by default). What is this? Is this only for devices that are GNSS capable for better accuracy than typical GPS. i.e. meter accuracy vs. 3 meter accuracy? It enables Android’s umbrella corporation to track the location of the device with sub-mm acuracy at 60Hz just for their crowd-sourced research purposes. And the benefits to the user are that it tracks a couple of extra satellites, fills up your storage space rapidly, eats all your data bandwidth, and increases your personal ranking in several corporate databases. I think it basically means that they are making the logs available to the public. Previously us mere mortals didn’t have a way to do that. Now you can PPK your phone. You just think you’re kidding !! Google, for example, will not allow voice searching (“Okay Google”) on Pixel phones unless you give them permission to track and log all your interactions with the world. Good thing I can still type! I don’t know if this is on all android devices or just their brand. Don’t worry though, it’s only meta data. AFAIK, Android applies duty cycling to reduce power consumption so GNSS signals are not tracked continuously and moving on from I think since Android 8, that has become an option in developer settings. So the API allows access to raw measurements (pseudorange, doppler, etc. depending on your phone model). Seems like more and more phones have coming out with improved gnss and dual-band capabilities of late (L1/L5, etc.). L1+L5 support for GPS is here! …or is it? Wow. Thank you. Great reading!